What happens in Marrakesh now that the Paris Agreement has entered into force? Friday, November 4, 2016 was a day for the record books: it marked the day that the landmark Paris Agreement on climate change entered into force, unlocking the Agreement’s legally binding rights and obligations for countries that have joined the agreement. This milestone came almost four years earlier than many expected even just last year. Rapid entry into force proves that the diverse political coalition of countries that constructed the Paris Agreement – both developed and developing, large and small – is alive and strong around climate change. It sends a powerful, immediate signal to global markets that governments take the agreement seriously, and that now is the time to ramp up investment in a prosperous, low-carbon future. Early entry into force also adds a sense of urgency to the work of the just-opened climate talks in Marrakesh under the United Nations Framework Convention on Climate Change (UNFCCC), known as COP22, from November 7-18. The inaugural session of the Conference of the Parties serving as the Meeting of the Parties to the Paris Agreement (CMA1) will take place in conjunction with COP22. Countries in Marrakesh will be expected to provide concrete evidence that the world is on track to effectively implement the Paris Agreement. The goal of the Marrakesh gathering is to maintain the strong momentum on climate action that comes from the trio of climate wins we’ve seen recently: entry into force of the Paris Agreement, the adoption of a market-based-measure to tackle significant climate pollution from airlines, and the phase down of HFC “superpollutant” greenhouse gases. To continue that momentum, countries in Marrakesh will be expected to provide concrete evidence that the world is on track to effectively implement the Paris Agreement, in the form of an ambitious workplan to complete the Agreement’s necessary infrastructure. The Agreement provides an inclusive, solid foundation for global climate action, but the “nuts and bolts” of how to implement the Agreement were left to future meetings. Key implementation tasks that will occupy negotiators in Marrakesh include Finalizing the Paris Agreement’s “enhanced” transparency framework and building an effective ambition mechanism. Transparency is the backbone of the Paris Agreement: It drives climate action by holding countries accountable to their commitments on action and support. more easily access resources needed for effective implementation, including via carbon markets. The details of the Agreement’s enhanced transparency framework must now be elaborated to ensure that countries demonstrate credibly and publicly how they are making progress against their commitments. Support should be made available to assist countries that need help to meet these new requirements. A variety of climate funds and support programs currently exist that can help developing countries to build the necessary institutional and technical capacity. At the same time, nations must now prioritize efforts to develop a set of clear accounting rules that prevent “double counting” of emissions reductions and facilitate the high-integrity emissions trading needed to drive emissions down and investment up. Double counting – applying one ton of emissions reductions towards more than one commitment, a sleight of hand that cheats the atmosphere – is explicitly prohibited by the Paris Agreement no less than six times. We know that the commitments pledged by countries thus far are not enough to limit warming below new temperature limits set by the Paris Agreement – “well below 2 degrees above pre-industrial levels” – let alone enough to meet the Agreement’s aspirational limit of 1.5 degrees. That’s why the heart of the accord is the process it establishes to periodically review countries’ progress toward meeting their commitments, and to ratchet up ambition over time, beginning with a global assessment (a “facilitative dialogue,” in UN-speak) in 2018 and updates of commitments in 2020. The Paris Agreement recognizes that cooperation on emissions trading between countries can help drive the ambitious emissions reductions that science demands. Under Article 6, the Agreement encourages the growing use of bottom-up agreements between jurisdictions to link markets for greater efficiency, as California and Quebec have done. Countries that prefer the option of an international structure can wait to utilize the nascent new market mechanism outlined under Article 6.4 of the Agreement – the strong rules and accounting standards necessary for this new approach must also be fleshed out by negotiators in the coming months and years. Prompt agreement on accounting for market mechanisms under Article 6, including how to practically implement the requirement to avoid double counting of emissions reductions, will help quickly build the infrastructure needed for carbon markets to drive ambition. In particular, the facilitative dialogue among Parties in 2018 to assess global progress appears to be a good time to provide additional clarity on the tools available under the Paris Agreement to increase ambition. Although the Paris Agreement specifies that the significant amount of work necessary to build its essential infrastructure must be completed by CMA1, countries are likely to agree a “procedural fix” to give themselves the time necessary to develop the Paris Agreement’s rulebook. For example, Parties could agree to keep CMA1 formally in session rather than gaveling it closed at the end of the COP, extending CMA1 – and the associated deadlines – until perhaps 2018. Countries used a similar fix to minimize procedural wrangling in the successful negotiations that led to the Paris Agreement. Given the Paris Agreement’s surprisingly quick entry into force, it is not surprising that negotiators will need more time to complete the long list of tasks on their plate. The upshot is that substantive discussions will occur instead in the COP, the APA (the “Ad Hoc Working Group on the Paris Agreement”) and the UNFCCC’s subsidiary bodies, in which all Parties to the UNFCCC can participate. As long as these bodies move promptly to accomplish their “to do” list, keeping discussions under the COP provides an additional benefit to inclusiveness and political “buy-in.” That’s because decisionmaking in the CMA is limited to only those Parties to the Paris Agreement, currently slightly more than half of those participating in the UNFCCC, but expected to be nearly equal by 2018. A decade ago, the presumptive approach to climate progress was a global governance structure driven by international institutions such as the U.N. Now, the challenges are more urgent and the landscape is more decentralized. “Minilateral” cooperation among groups of countries is emerging as a focal point for climate action. The prospect of “climate clubs” is gaining currency as a vehicle for securing greater investment, market access, and financial stability, and for driving greater ambition in climate action. For example, a coalition of carbon market jurisdictions, or “CCM”, could go faster and farther than the UNFCCC in promoting coordination among carbon markets, ensuring environmental integrity, and ultimately spurring greater ambition in climate action. Robust coalition standards could potentially inform global approaches, complementing and building additional momentum for climate efforts under the UNFCCC. No major environmental problem is solved with one document. The Paris Agreement provides a solid foundation for cooperation among jurisdictions, but nations recognize that progress on climate depends on implementation at home. It’s time for countries to roll up their sleeves and get to work on the rules, guidance, and domestic policies that will put Paris into practice. The significant political will reflected in the entry into force of the Paris Agreement now needs to be translated to building the essential infrastructure for implementation. The world is watching. What to expect for forests and REDD+ at COP22 in Marrakesh? With the Paris Agreement entering into force on November 4th, climate negotiators at this years’ climate talks (COP22) in Marrakesh will have to roll up their sleeves and get to work on the rules and guidance that will translate Paris climate commitments into action. As the only sector with its own article in the Paris Agreement, the land sector will be discussed this year in the context of implementation and progress – especially REDD+. There are no agenda items directly addressing forests at COP22, so REDD+ negotiators will need to focus on how REDD+ fits into other items on mitigation, accounting, transparency, and markets. Forests will also be highlighted during a series of COP events in the Global Climate Action Agenda (GCAA). On November 8th—the US election day—the Global Climate Action Agenda (GCAA) will showcase important forest initiatives. Held alongside the negotiations, the GCAA is meant to highlight initiatives not only from nation states, but also from a broad set of stakeholders including civil society and the private sector. Partnerships among these stakeholders will be especially emphasized. The GCAA will also highlight the New York Declaration on Forests annual assessment report, which was released globally on November 3rd. This year’s report focused on private sector’s implementation of their zero-deforestation supply chain commitments. The report also gives a good overview of overall progress against halving deforestation in natural forests by 2020, which should be at the center of the discussions at the GCAA forest showcasing event. While I find it heartening that many companies based in North America, Europe, and Australia are making deforestation commitments, the world’s forests need countries and companies in emerging markets to start implementing and reporting on their commitments. At COP22, REDD+ negotiators will most likely be found at the sides of their colleagues that focus on transparency and accounting. REDD+ methodological guidance included in the Warsaw Framework for REDD+ and other previous decisions already ensures a high level of transparency in any REDD+ programming. Experience with effective transparency provisions under REDD+ provides an opportunity to inform the development of the “enhanced transparency framework” that will be critical to the success of the Paris Agreement. Accounting in the land and forest sector is as important as that in other sectors – if not more important, given the sector’s potential to remove carbon dioxide from the atmosphere. It is critical to ensure that consistent principles apply throughout all sectors, including effective accounting that avoids double counting of emissions reductions. To promote environmental integrity between countries’ policies to implement REDD+, a report published today by EDF and four other leading organizations collected recommendations from experts from REDD+ countries and technical assessment teams on forest reference levels. It provided key guidance for tropical countries to receive payments for results from REDD+. The negotiations on markets will probably be some of the most interesting. Markets could provide a much needed source of funding to support results from REDD+, while REDD+ could provide useful lessons for the development of accounting guidance for Article 6 (related to transfers of mitigation outcomes), as detailed in our joint submission with four other leading observer organizations. Countries may choose to use REDD+ emission reductions as Internationally Transferred Mitigation Outcomes (ITMO) under Article 6.2 of the Paris Agreement, consistent with the Warsaw Framework and other REDD+ decisions. The use of ITMOs toward national commitments must also be consistent with the accounting guidance yet to be developed under Article 6.2, including the clear requirement to avoid double counting of emissions reductions. The country of Brazil offers an example of where the REDD+ and ITMO debate is playing out. Recently, the Brazilian Coalition on Climate, Forests and Agriculture, made up of over 130 leading environmental NGOs and companies has recently, after extensive internal discussion, approved a consensus position on REDD+. Their position – that can be found here – posits that the positions of Brazil’s international climate negotiators dealing with land use – in particular their opposition to market-based REDD+ and failure to recognize subnational REDD+ systems in national carbon accounting – do not reflect the overwhelming majority views on these issues in Brazilian society. It will be interesting to see these differences between Brazilian society and their climate negotiators debated at the COP. It is not clear how forests or REDD+ will be featured in the new market mechanism to contribute to the mitigation of greenhouse gas emissions and support sustainable development (under Article 6.4 of the Paris Agreement). I don’t expect negotiators to start discussing a new REDD+ methodology for Article 6.4 in Marrakesh, and this is likely many years down the road. As previous analysis has shown significant costs savings from using REDD+ in carbon markets, I expect countries interested in using markets to discuss the details of transacting REDD+ ITMOs next year, either within the UNFCCC negotiations or in clubs of carbon markets in parallel to the UNFCCC. The Marrakesh COP will probably yield less tangible text related to REDD+ than past UNFCCC meetings, though REDD+ negotiators will probably have much to discuss with each other outside the negotiating rooms. What I will be looking for are signs that REDD+ implementation is accelerating and how the accounting and transparency discussion in the UNFCCC might impact REDD+ and the forest sector. A bright spot amid Brexit? Growing momentum for global climate action. Last week’s vote by the British to leave the European Union has triggered a crisis in political leadership, thrown financial markets into turmoil and prompted eulogies for the European project – even as the ultimate consequences of the vote remain uncertain. Against that backdrop, a bit of good news may be welcome. And it comes from an unlikely quarter: climate action. That may sound surprising at first since climate change was hardly a high-profile issue in the Brexit campaign. Voting on the referendum reflected concerns about inequality, immigration, globalization, multiculturalism and an out-of-touch political elite. Even so, the prospect of the United Kingdom’s departure has raised concerns about impacts on climate and energy policy, including possible delays in finalizing the EU’s 2030 emissions target. But whatever the implications may be for Britain and the EU, one thing is clear: Brexit can’t derail the overwhelming global momentum on climate action that produced the Paris Agreement. A British exit from the EU would not have any effect on the formal architecture of the agreement, which was approved last December by more than 190 countries and has been signed by 177 – including each of the EU member states. Given that overwhelming support, the agreement may very well enter into force this year – something that will happen once at least 55 countries representing 55 percent of global emissions formally join the agreement. To date, 50 countries representing more than 53 percent of global emissions have formally joined or committed to join the agreement this year — closing in on the threshold of 55 countries and 55 percent of emissions needed for the agreement to enter into force. As a result, the agreement may well enter into force as soon as this year, even without the EU (which was not expected to join the agreement this year in any case). This signals a remarkable shift. A decade ago, Europe was the world’s indispensable leader on climate action – and even temporary uncertainty about the pace of progress in the EU would have had repercussions around the globe. The Paris Agreement, however, was the culmination of a paradigm shift away from a model of “top-down” climate action concentrated in a handful of countries, and toward more a more decentralized and inclusive approach. As climate action has become much more broad-based, it has also become more resilient. That is not to say that leadership on climate from both the U.K. and the EU is not vital; it is, and will continue to be. Taken as a whole, Europe is still the world’s third-largest emitter. It remains a powerful and valuable voice for ambition. Fortunately, political support for climate action in the region remains high, with 60 percent of Europeans saying global warming is already harming people around the world. The leaders of the three North American countries met today to announce greater cooperation on climate change – including major new commitments on clean energy and on methane emissions from oil and gas. Under the leadership of President Obama, the United States is now a global leader on climate action, with U.S. emissions in 2014 at 9 percent below their 2005 level, and an ambitious target of reducing emissions between 26 and 28 percent by 2025, relative to 2005. President Xi Jinping of China has made tackling climate change a priority, with a commitment to ratify the Paris Agreement this year, a pledge to peak China’s emissions by 2030, if not before; and a plan to institute a nationwide emission trading program as early as next year. The unprecedented bilateral cooperation between the U.S. and China, culminating in the joint announcements on climate change made by Presidents Xi and Obama in November 2014 and again in September 2015, were a crucial step in laying the foundation for success in Paris. Brazil – although currently engulfed in political turmoil of its own – has reduced emissions over the past decade more than any other country, thanks to the enormous success of its Amazon states in curbing tropical deforestation. India, where the moral imperative of poverty alleviation remains paramount, is committing to renewable energy and experimenting with new models of low-carbon development. Underlying these country-level shifts are more fundamental drivers. The impacts of climate change are becoming increasingly more visible, in record temperatures and extreme weather events. A clean energy revolution is underway: Wind power is competitive with coal in much of the world even without subsidies, the cost of solar panels has dropped 75 percent in less than a decade and new technologies for how we use and store energy more efficiently are transforming markets. Meanwhile, leading companies are stepping up by reducing their carbon footprints, greening their supply chains and calling for policies such as a price on carbon. In short, leaders around the world have come to the realization that the path to shared global prosperity is a low-carbon path. That makes the politics of climate action more resilient now than they ever have been before. And that is good news to keep in mind in these uncertain days. This post originally appeared June 29 on EDF Voices. As countries gather here in Bonn, Germany to begin the work of translating the historic Paris Agreement into action, there is widespread recognition that individual countries’ carbon-cutting pledges must be strengthened in the coming years to deliver the ambitious long term goal agreed in Paris: keep warming “well below” 2 degrees Celsius (3.6 degrees Fahrenheit), and achieve global net zero emissions before 2100. The Paris Agreement provides several market- and transparency-related tools that can help spur the international cooperation necessary to achieve its long term goal, including provisions that facilitate high-integrity, “bottom-up” linkages of domestic carbon markets to cut carbon pollution. These linkages (described in Article 6 of the Paris Agreement as “cooperative approaches”) promise to reduce costs, and unlock the finance needed to drive deeper global emissions reductions. The agreement on cooperative approaches in Paris reflects the widespread recognition among nations that carbon markets, accompanied by a clear, comprehensive transparency framework, will help drive the deep emissions reductions needed to prevent the most severe impacts of climate change. With the urgency of climate action clear, the key challenge now becomes: how can we accelerate the international cooperation needed to solve the Paris equation? One concrete step, drawing on the cooperative approaches provisions of the Paris Agreement, would be to establish a coalition of carbon market jurisdictions to catalyze the development and increase the ambition of domestic carbon markets. Much as the General Agreement on Tariffs and Trade (GATT) helped broaden participation and ambition in trade, a voluntary coalition of carbon market jurisdictions (CCM) could expand the scope and maximize the cost-effectiveness of ambitious climate action around the globe. Why coordinate on carbon markets? As carbon markets continue to expand, coordination among jurisdictions using or considering carbon markets – especially on the rules and standards needed to ensure environmental integrity and maximize cost-effectiveness – will give governments and the private sector the confidence to go faster and farther in reducing their climate-warming pollution. A coalition of carbon markets can help deliver on the promise of the Paris Agreement and catalyze the deep global emissions reductions that climate science demands. Although the Paris Agreement provides a framework for international cooperation on carbon markets, it is ultimately up to countries to work together to agree the detailed rules necessary for international carbon markets to drive emissions down and investment up. The good news is that groups of countries can make substantial, early progress, ultimately informing and complementing the longer-term UNFCCC process. Rapid and early emissions cuts are the single most important determinant of whether the global community is likely to meet the Paris Agreement’s goal to limit warming to well below 2 degrees Celsius (3.6 degrees Fahrenheit). And delaying necessary action to reduce global warming pollution dramatically increases costs to the global economy. For both the climate and our economies, not all emissions reductions are the same: the earlier, the better. That’s why it is so important that Article 6 of the Paris Agreement affirmed that cooperative emissions trading between countries can continue and expand while multilateral accounting guidelines are developed. Transactions will need to be “consistent with” any multilateral guidance developed by Parties to the Paris Agreement over the coming years – particularly to ensure that the same emission reductions are not claimed toward more than one mitigation pledge (“double counted”). A “minilateral” coalition of carbon markets could complement efforts under the UNFCCC by fostering agreement on detailed standards for the accounting, transparency, and environmental integrity of internationally transferred emissions units. These “nuts and bolts” standards, which will help avoid errors in tallying up total emissions and traded units, form the bedrock of high-integrity emissions trading. Early agreement would give countries the confidence to move forward quickly in implementing their Paris pledges and a basis for increasing their ambition over time. Practically speaking, future UNFCCC guidance on cooperative approaches will likely be influenced by working examples of international emissions trading, making the success of a carbon markets coalition an important precedent for broader cooperation on markets in the UNFCCC. This process could mirror recent progress on standards for reducing emissions from deforestation and degradation (REDD+), where technical advances made by countries in the Forest Carbon Partnership Facility contributed to greater progress in the UNFCCC. In Paris, a diverse group of 18 developed and developing countries led by New Zealand announced that they will work quickly together to develop standards and guidelines to ensure the environmental integrity of international market mechanisms. This group – or another similar coalition – could “set the bar” for market-based climate action by developing robust accounting and transparency standards for environmental and market integrity. Coordinated leadership by forward-looking jurisdictions would help ensure that the growth of international emissions trading is accompanied by enhanced ambition and real, permanent, additional, and verifiable emissions reductions. Over a longer period, these same guidelines could support the establishment of a common trading framework among a coalition of carbon market jurisdictions. 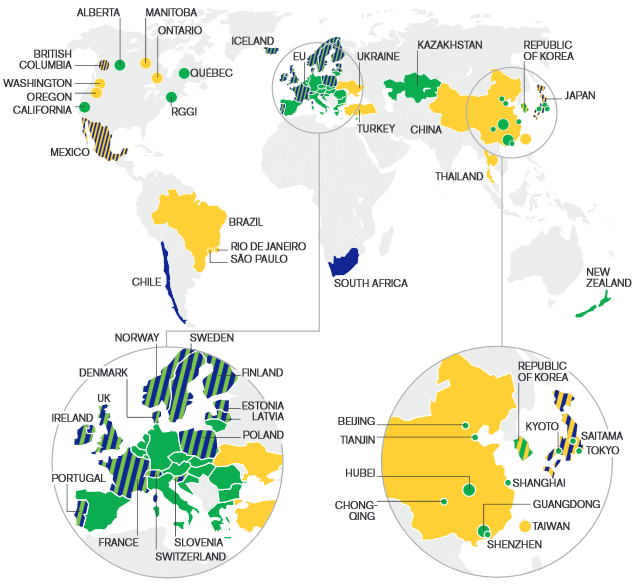 A framework might include mutual recognition of emission units, harmonized approaches to verifying emissions reductions and generating offset credits, and a shared trading infrastructure, which together could ensure environmental integrity and encourage more countries, states, and provinces to cap and price carbon. Paris began a new, more ambitious chapter in the history of climate action, but much of the chapter is yet to be written. We’re in the race of our lives to finish the work of protecting future generations and building prosperous low-carbon economies. A coalition of carbon markets can help deliver on the promise of the Paris Agreement and catalyze the deep global emissions reductions that climate science demands. United States and more than 160 other countries set to formally sign the Paris Agreement on Earth Day 2016. Photo: Secretary Kerry Sits With UN Secretary-General Ban Before a Bilateral Meeting at COP21 in Paris. UN Secretary General Ban Ki-Moon has invited countries to sign the Paris Agreement at the UN headquarters in New York on April 22, the first day the Agreement is open for signature. Here are seven reasons why the Earth Day ceremony is important. 1) The April 22 signing ceremony for the Paris Agreement is expected to shatter the record for the most countries to formally sign an international agreement in a single day. Representatives from more than 160 countries (and counting – see the latest at the UN site), including sixty heads of state, will be in New York to signal their commitment to the Agreement struck in Paris last December. This would surpass the previous record of 119 signatures, set by the UN Convention on the Law of the Sea in 1982. The Paris Agreement aims to hold the increase in the global average temperature to well below 2 °C above pre-industrial levels, and to pursue efforts to limit the temperature increase to 1.5 °C. This record-breaking signing ceremony demonstrates the political momentum behind the Agreement’s global plan to tackle climate change. 2) Signing is the next step for countries to join the agreement, but is not the end of the story. Signing the Agreement in New York sends a strong and early signal of a country’s intention to launch its domestic processes necessary to join the Agreement. Once those processes are concluded, Governments will formally deposit with the United Nations Secretary-General, who is the depositary of the Paris Agreement, their “instrument of ratification, approval, acceptance or accession,” by which they formally join – and consent to be bound by – the Agreement. Some nations will sign and join the Agreement on the same day, since they have already completed the necessary domestic procedures back home. States that don’t sign on April 22 still retain the ability to join the Agreement later. 3) The content and structure of the Paris Agreement means the U.S. can join quickly. Like the vast majority of international agreements that the U.S. joins, the Paris Agreement does not require Senate action. Presidents from Washington onward — including Ronald Reagan, who did it 14 times in his second term — concluded agreements like this as “executive agreements,” based on existing executive authorities. These executive agreements have the same binding force domestically as any other international treaty or agreement the U.S. joins. As long as the U.S. president has authority under existing U.S. law to implement the Paris Agreement’s provisions, the pathway to U.S. participation in the Paris Agreement is open, and does not need to include a stop in the Senate. As it did with the Minamata Convention on Mercury, the U.S. can join the Agreement by simply depositing a brief formal document (called an “instrument of acceptance”) with the UN. 4) Early implementation of the Paris Agreement is now more likely. Language in the draft agreement preventing it from taking effect until 2020 was dropped during the final stages of negotiations in Paris, so the Agreement will enter into force 30 days after at least 55 countries representing at least 55% of global emissions join. Together with important statements from the U.S. and China (which together represent almost 38% of the world’s emissions) indicating they will sign the Agreement on April 22, and formally join the Agreement this year, the record-breaking signing ceremony means that many countries are on the path to joining the Agreement soon. The Paris Agreement is likely to enter into force well before 2020, and possibly by 2017, making the provisions of the Agreement legally binding on those countries that have joined. Early entry into force offers the opportunity to accelerate a global transition to the prosperous, carbon-neutral economies of the future, and better address the needs of those communities in the U.S. and abroad that are most vulnerable to the impacts of climate change. 5) Momentum is building for markets to play a central role in meeting the ambitious climate goals agreed in Paris, and called for by science. The groundswell of international support for the Paris Agreement contributes to confidence that countries can achieve the Paris Agreement’s vision of international cooperation on carbon markets to reduce emissions. Only by harnessing the ingenuity and creativity of business, entrepreneurs, and innovators will we be able to drive down emissions fast enough and far enough to achieve the reductions that the science demands. An April 14 report by EDF and the International Emissions Trading Association (IETA) found countries can surpass their Paris pledges by pricing carbon through carbon markets. By affirming a role for carbon markets, the Paris Agreement recognizes the realities already on the ground, where emission trading systems are at work in over 50 jurisdictions home to nearly 1 billion people. When China adopts a national carbon trading system, beginning in 2017, that number will rise to 2 billion – almost a third of the world’s population. The Paris Agreement provides a framework for cooperation among jurisdictions, but nations still must step up with effective and transparent domestic carbon markets. Almost half of all countries have already either stated their intention to use international carbon markets to cut their carbon pollution, or are already employing them domestically, at the national or subnational level. 6) Accelerated action on forest protection is a key to global and national efforts to reduce emissions. Many of the countries participating in the New York signing ceremony are taking important steps to protect their forests, under an agreed international framework for Reducing Emissions from Deforestation and forest Degradation (REDD+). Forests are the only sector specifically mentioned in the Paris Agreement, signaling political recognition of the urgent need for better protections as well as financial incentives that confirm that forests are more valuable alive than dead. Outside of the climate negotiations, Germany, Norway and the UK confirmed their support by pledging $5 billion in REDD+ funding between 2015-2020, while developing countries presented their progress on creating and implementing REDD+ programs. 7) Clear and growing momentum to implement the Paris Agreement shines a spotlight on the next big climate win the world needs: adoption of a global market-based measure in the International Civil Aviation Organization (ICAO). International aviation wasn’t covered in the Paris Agreement, due in part to these emissions falling outside national emissions accounts. However, the UN’s aviation arm is working on a deal this fall that would limit emissions from this rapidly growing sector. ICAO is developing a proposal for airlines to offset all emissions above 2020 levels through high-quality, rigorously verified emissions reductions in other sectors – such as through reductions in emissions from deforestation, achieved under the UNFCCC’s “REDD+ Framework”. A cap on aviation at 2020 levels could achieve 8 billion tons of emissions reductions in the next two decades – reductions that would otherwise not be obtained under the Paris Agreement. As nations around the world consider the results of the historic climate agreement reached at the 21st annual climate talks in Paris last December, one thing is clear: the Paris Agreement is contributing to – and a sign of – growing momentum around the world to address climate change. For the first time in history, nearly all the countries of the world have put forward concrete pledges to cut pollution and address the impacts of climate change on local communities. A more ambitious global goal, in which nations agreed to hold warming to “well below” 2 degrees Celsius (3.6 degrees Fahrenheit) above pre-industrial levels, and “pursue efforts” to limit warming to no more than 1.5 degrees Celsius (2.7 degrees Fahrenheit). A requirement that nations come back to the table every five years to strengthen their individual pledges, in order to achieve their collective goal over time. An enhanced transparency framework, requiring regular reporting and review of all nations’ climate efforts. These three elements of the Paris Agreement reflect the widespread recognition among nations that carbon markets accompanied by a clear, comprehensive transparency framework will help drive the deep emissions reductions called for by science. By affirming a role for carbon markets in international climate cooperation, the Paris Agreement recognizes the realities already on the ground, where emission trading systems are at work in over 50 jurisdictions home to nearly 1 billion people. When China adopts a national carbon trading system, beginning in 2017, that number will rise to 2 billion – almost a third of the world’s population. And more than half of the world’s countries are using, or plan to use, carbon markets to stimulate the innovation and investment needed to meet their Paris climate pledges. With the UN now blessing the growing use of bottom-up cooperation between jurisdictions to link their markets and spur greater efficiency, as California and Quebec have done, the challenge now becomes how to accelerate the transparent, high-integrity international cooperation needed to solve the Paris equation. That cooperation – needed both inside and outside the UNFCCC – is the subject of my next post.